We visited the Eden Project in Cornwall, England on May 15, 2014. We took the train from Paddington Station in London and the bus from the St. Austell station to the Eden Project. The Eden Project, which opened in 2002, was built-in a 35 acre reclaimed, open clay pit, 180 feet deep. It was partially filled with soil and recycled waste. On top of this was built two enclosed biomes; one a Rainforest Biome and one a Mediterranean Biome. The Rainforest Biome is about 750 feet long by 330 feet wide and 150 feet high. It contains over 1,100 different species of plants and has areas devoted to West Africa, Southeast Asia, Tropical Islands and Tropical South America. The Mediterranean Biome is about 90 feet high and contains over 850 different species of plants. It represents the Mediterranean, South Africa and California. In addition to the two major Biomes, there is a Core educational, administration and museum building along with an Outdoor Biome. There is an outdoor stage, paths, parking and a land train. 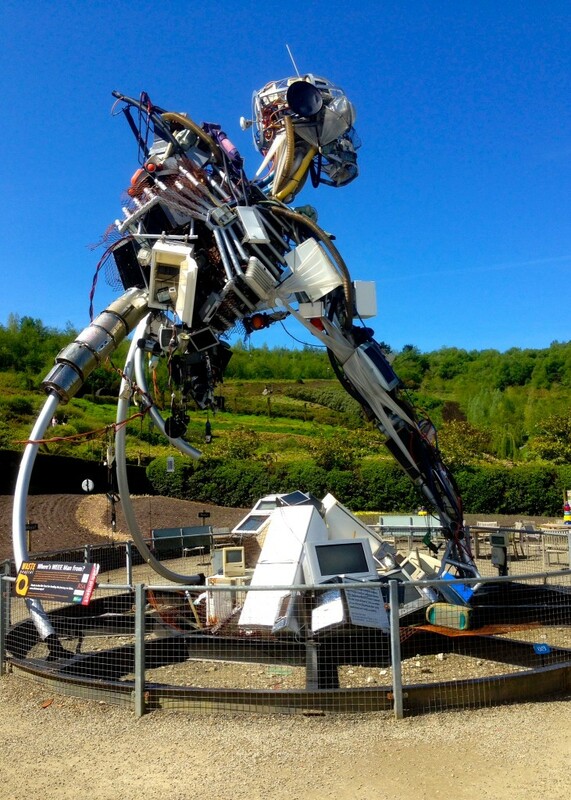 WEEEman, 3.3 tons of sculpture made from the Electrical and Electronic Equipment waste thrown away in one person’s lifetime. There are several restaurants serving a variety of “responsibly sourced, fairly-traded, direct sourced, organic, seasonal, and/or local and freshly made” food. There are numerous Bed and Breakfasts” in St. Austell. We stayed for two nights at The Grange in St. Austell. The Grange Breakfast Buffet. The included full English breakfast is not shown. It is easy to get there, even if you are old. Take the train from Paddington to St. Austell; check into a bed and breakfast: take the free bus from the train station to the Eden Project. Enjoy. You should compare this to Biosphere 2 in Tucson, AZ and Arcosanti in Cordes Junction, AZ. You should think about how old open-pit mines and remote places can be re-configured as educational, research and residential communities for the future. Maybe you would like to live in one. Maybe it is a partial solution to the aging problem. If so, go to their web pages; they all allow for interns, visitors, and maybe a new career. The Guide – Eden Project Books, revised edition 2016.